Toenail fungus is often embarrassing, unsightly, and painful and can lead to dead toenails. 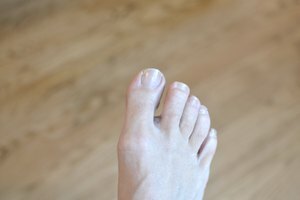 Infections can occur in both fingernail and toenails, but toenails are more prone to fungus because of the dark and damp environment in which they reside. The nail provides a protective cover for fungus to grow under. When a toenail is dead, removal is key to ending pain and the toenail's unsightly appearance. The fastest way to remove a dead toenail is to see a doctor. You do not want to attempt to remove a toenail at home by yourself or enlist the help of someone who is not qualified. Professional help ensures that you will decrease the chance of spreading infection and will minimize any pain associated with the procedure. Make an appointment with your general practitioner. Note, however, that you should not have your nail removed if you have poor circulation as an excision could lead to a serious infection and potentially the loss of the toe or leg. Treat poor circulation first before you treat a disfigured toenail. While oral medications and medicinal toe fungus drops will not be as fast as a doctor's removal of the infected toenail, they can often heal your toenail quite fast and encourage regrowth. Oral prescriptions include the active ingredients itraconazole, fluconazole, griseofulvin or terfinabine but can sometimes have side effects that include upset stomach, headaches or liver damage. If you are concerned with side effects, topical natural treatments containing tea tree, lavender, and thyme have shown to be effective as well. Patience is key with a dead toenail. A nail does not grow back overnight even if you have it removed immediately. Use warm water and epsom salt soaks to combat pain throughout the duration of your toe fungus episode, from removal to healing. The key to avoiding dead toenails is to prevent toenail fungus from occurring. Prolonged wear of toenail polish can instigate dead toe nails. Give your toes one-week breaks in between toenail polish color changes. Let them air out and be fresh with no polish. Polish can harbor fungus beneath the toenails giving the growth the dark, moist, warm environment that it requires. Wash and dry your feet thoroughly and make sure to wear sandals in public showers, locker rooms or pool decks, as fungus enjoys these types of environments. Wear 100% cotton, wool, or silk socks to absorb foot moisture and shoes that provide aeration and ventilation. Nikki Fiedler started writing professionally in 2004. She has been published in "The Vegetarian Journal," "Collegebound," "The Sandspur," "Orlando Style Magazine" and "Rollins Alumni Record." Fiedler graduated from Rollins College in 2008 with a double honors Bachelor of Arts degree in international relations and studio art.